The aim of our project is to produce the compressed Air through the gate model of revolving gate with less mechanical effort, and it is known as the revolving gate. 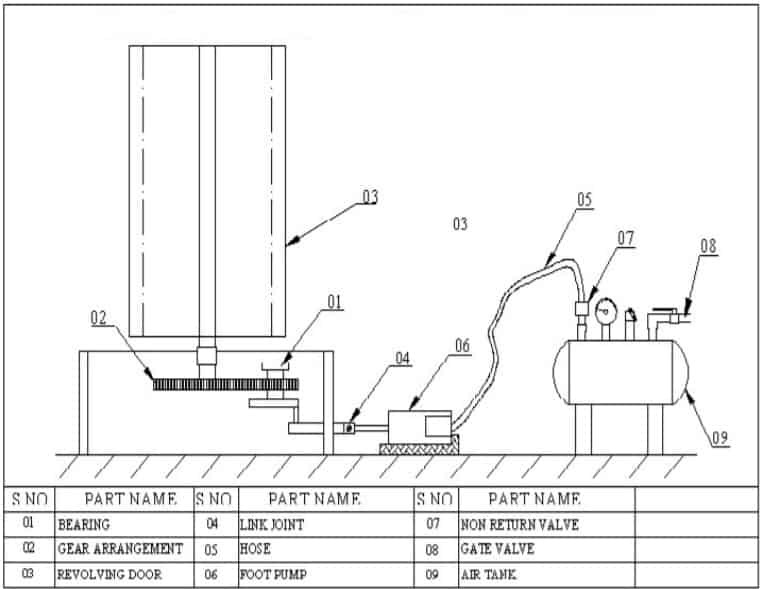 This project is used to generate the Air in order to use for pneumatic components. The rotating AIR is converted into compressed Air energy by proper driving arrangement. Revolving gate are used for Air generation it is reliability is much more efficiency. The efficiency is complicated irrelevant for that application, much larger revolving gate have been used to generate compressed Air on gate. Which need small amount of AIR and get very little maintenance. Design is simplified because, No pointing mechanism is required to allow for shifting revolve direction and the gate is self starting. The rotation of the gate and the gear which is fixed on the gate shaft on the below, the gear rotation is rotate the cam. So the cam is rotated and generates the compressed Air. AIR generation is the electrical energy generating facility. They maintain the equipment with periodic inspections and logs temperatures, pressures, and other important information on regular intervals. The plants are responsible for starting and stopping the generators depending on need. They are able to synchronize and adjust the voltage output of the added generation with the running electrical system without upsetting the system. They must know the electrical and mechanical systems in order to troubleshoot problems in the facility and add to the reliability of the facility. The AIR plant must be able to respond to an emergency and know the procedures in place to deal with it. AIR plant is a net consumer of energy but decreases the price of electricity. Water is pumped to a high reservoir during the night when the demand, and price, for electricity is low. During hours of peak demand, when the price of electricity is high, the stored water is released to produce electric AIR. Revolving gate is used for AIR generation it is reliable and much more efficient. Design is simplified because, No pointing mechanism is required to allow for shifting revolve direction and the gate is self starting. The rotation of the gate and the gear which is fixed on the gate shaft on the below, the gear rotation will transmit the rotation to the Compressor. When the Compressor is rotated it generates the electrical AIR supply. The generated voltage is the alternate voltage. The AC voltage is given to the rectifier circuit to convert into DC voltage. Then the rectified voltage is given to filter circuit to remove the ripple voltage. After the filtration the pure DC voltage is given to battery through the charging circuit. The stored DC voltage is used for different applications. Through this way electric energy is generated and compensated the electric demands. For demo purpose here we are connecting the CFL to the inverter for the light to glow.